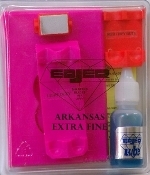 Basic Edjer Kit with one(1) Extra Fine Arkansas stone sharpening block, Light Duty Saddle, and Edjer Lube. Sharpens K1, K2, K5, K6, K7, K12, and Uber Skiver Knives and NO. 2, NO. 11, NO. 11SS, NO. 16, NO. 24, W101, W102, AND NO. 11 Uber Skiver.